There is so much about this actual passage of Lazarus’ death that shows such a tender concern for us. Your worries Jesus shows up for, your sorrows he weeps with, and your burdens he carries. Why? Because he is deeply in love with you. He knows your heart. He holds it in his hand. What touches your heart touches his. Don’t ever think differently. If you have time, read all of John 11 and you’ll see this play out. The other point that we need to see today is Martha’s reactions to Jesus in this passage. When he first shows up, Lazarus is dead. Jesus tells Martha that Lazarus will rise again, and she does not doubt who Jesus is or the power he holds. She believes. Believes that anything Jesus says he can do, he can do. But if you drop down in the passage a little ways, you’ll see when Jesus stands before Lazarus’ tomb and tells them to roll away the stone, Martha’s reaction changes slightly. She questions him about the stench that will come when they roll away the stone. For Mary, Jesus could do anything except take away the nasty odor clinging to the grave. Oh, are we like Mary. So many of us believe in the power of Jesus. We believe he is the Son of God sent to die on a cross. We believe he conquered death so we can live. Yet when it comes to our sins, we don’t believe he can remove the stink of them from our lives. Nothing could be farther from the truth. Jesus’ power does not stop at simply resurrecting our spiritual lives. He doesn’t only give life, he gives life abundantly. Life filled with a beautiful aroma. 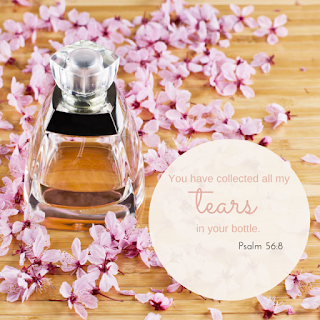 He loves us enough to weep with us, and too much to leave us wrapped in old stinky clothes. You are his child, and you receive his best. Which means wiping your tears, removing the odor from your past life, and wrapping you in fresh clothes. Lord today let me know without question that you have removed all of my past. There is no stink left because you’ve washed me clean. Anything that has tried to cling to me, let it be gone today in this moment. Help me to see myself as you have made me. Loved and radiant in you. Amen. Note for today: I had the joy of writing for Happy Sis Magazine's current issue - a new magazine for women. You can check out their site here and look for my article, "A Confident Clean" in their third issue, Self-Confidence.